The quote in the last gun control poster apparently was an urban legend, but it did reflect an essential truth that armed societies are harder to enslave. I don’t know if the specific numbers in this poster are accurate, but it does emphasize another fundamental truth. Many leftist politicians are insulated from the dangers of ordinary life and this may be one of the reasons that they have little regard for Second Amendment rights. Philippe … Why do you believe that Obama is “obviously an international target?” Next of all, while your international target is protected, it’s the the average American who is burgled, robbed, beaten, raped, etc. not just the “random hicks.” And you should better ‘learn’ yourself to information that includes the fact that automatic weapons have been illegal to own in the U.S. since a 1930 Supreme court ruling – except, of course, for police, military and criminals …. I find this poster v strange, as the president he is obviously an international target. On the contrary who wants to kill some random gun toting hicks? This is simply your inauguration to ridicule. If automatic weapons weren’t in circulation you wouldn’t need one for you protection, are we simply monkeys running around trying to find bigger sticks to hit each other with or are we able to see the bigger picture? The phrase “right of the people” appear in Articles I, II, IV & X of the Bill of Rights, yet the only one that is debated is the Second Amendment . . . Why is that? If the pinheads we have for politricians had to live where the bulk of Americans do, thye’d arm themsleves as well. If 0bama, living in Washington DC, had to fend for HIS wife and kids every night, when the predators are out, he’s want more than a hatpin to use in defense. 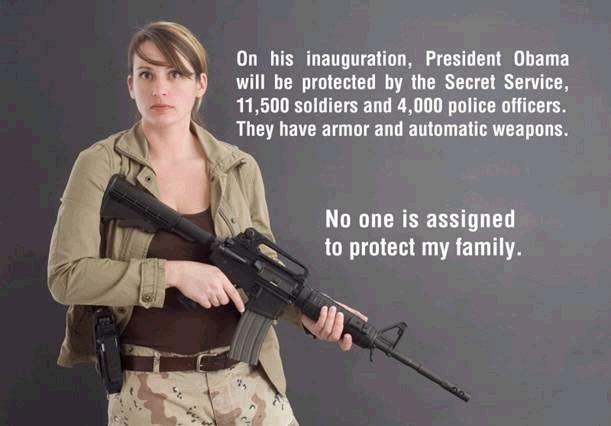 I have a pretty good excuse to have protection too. My life is just as valuable to me and my family as Obama’s is to his. Go eat some more yogurt and drink more government koolaid. It certainly appears to be your style. Great poster. So true….Although, not everyone is the leader of the free world. That does put a pretty big target on your head. Considering the assassinations and attempted assassinations of past presidents, Obama has a pretty good excuse to have protection. I think that chick in the poster is doing a little more than protecting her family. Looks like she’s going to take out a small village in Vietnam or something.